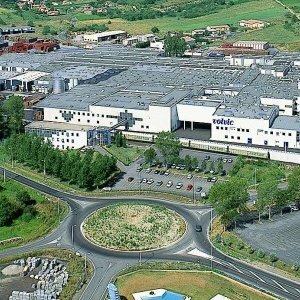 The target area is the catchment of Volvic Waters, owned by Danone, which covers 3800 Ha across four communes of the department of Puy-De-Dôme located in the surrounding of Clermont-Ferrand City in France. These 4 communes all belong to the community of communes, or intercommunity, called “Volvic Sources et Volcans” (VSV) encompassing 7 communes and 18,000 inhabitants. Danone is one of the main regional employer (about 1000 employees on-site) and a significant source of local tax (about 40% of the VSV annual budget). Since 2007, the company has initiated a water catchment strategy that involves public stakeholders and land managers (farmers in particular) in order to prevent water from pollution, water shortage and improve its brand reputation. The catchment area of 3800 hectares is mostly covered with forest (53%) and agricultural land (41%). Forest resources are dominantly private (86% of forests) and unmanaged. Agricultural land is mainly pasture supporting extensive cattle raising (mostly for meat production but also dairy). Agricultural production is generally not transformed locally and marketed outside the territory through the conventional market (only 2 farmers sell their meat under an official quality sign). The remaining 6% of the watershed correspond to urban areas. The catchment is located at the piedmont of an old volcanic area (La Chaine des Puys) with a medium altitude of 500m above sea level, and the highest point at 998 m. Despite the proximity with the Clermont-Ferrand agglomeration (300 000 inhabitants), the average density of population is low at only 63 inhab/km2, with a concentration in the commune of Volvic (162 inhabs/km2) and a high dispersion in the rest (30 inhabs / km2). In 2007, Danone - who owns the Volvic water company - developed a strategy in partnership with the local public authorities to maintain high and constant mineral content levels in this valuable watershed and to manage water contamination and shortage risks. The resource system in Volvic case study is composed by ground resources (aquifer) and sur-face resources (both forestry and agriculture). Five environmental and social benefits have been identified: water quality, water availability, landscape, rural vitality, biodiversity. They are all interconnected, but water related services are more depending on the rest. The specificity of this study case is that the resource system is used by a private company that understands that groundwater’s value comes partly from intrinsic characteristics of water, and partly from the whole resource system (value of the natural environment). That’s why Danone supports the protection of both ground and surface’s resources. Market’s drivers play a central role in the production of the services. Main contribution of agriculture in the provision of environmental and social services are the maintaining of extensive agricultural practices, which preserve groundwater’s quality. Agriculture is maintained in the zone thanks to CAP less-favoured areas subsidies. New governance arrangements have the potential to bring about long term improvements for the delivery of environmental and social benefits. In this case study, the association regrouping the 4 municipalities of the watershed and Danone was created in 2005 to collectively manage the water catchment. Economic interests is the main driver that explains the involvement of downstream stakeholders. Danone wants to sustain its business while local authorities want to sustain a significant source of local tax. Maintaining a good public image is also essential for Danone: the ecosystems and land uses located in the water catchment have to be perceived as healthy. Finally, regulations regarding mineral water imposes Danone to maintain a constant mineral content, which requires implementing measures that go beyond current land management regulations applicable in the area. Local economic incentives and investments are an important factor of change in agricultural practices. These changes are also more likely to get farmers’ support if they are economically attractive and/or technically relevant for their farms but also if the process of emergence and diffusion is participatory and guarantees freedom of decision. maintenance of the specific natural characteristics of the water in this area. Maintaining the current extensive agricultural practices contributes to preserving a high-water quality. rural development pillar of the CAP. likely be too costly for local public authorities to maintain this payment over a longer period of time. Rather, it pays for land related activities which support farmers in the maintenance of extensive practices. In a broader reflection on drinking water protection in France and in Europe, the approach developed by DANONE could be beneficial for local public policy-makers. On the contrary of Nestlé in Vittel (see Chia, Brossier and Benoit 1992), DANONE has not engaged in a direct payments for ecological services approach which is a very costly policy (about 25 million € invested in Vittel by Nestlé waters to protect an impluvium equivalent in size), not affordable for local public policy-makers. Indeed, a recent report released by the French Ministry of Environment (2014) estimates the damages caused by farming activities (mainly nitrates) to the water resources management (used mainly for tap-water) up to one billion € per year. At last, this experience could be particularly useful in cases where there is a strong private interest for water quality: industries such as thermal water or other pharmaceutical companies could be interested. The formation of new public-private and private-private partnerships was the primary way to induce change. The main issues at stake are the management of the pollution risk and the brand image of Volvic, rather than solving a problem of under provision of environmental and social benefits in the region. The convergence of interests is one key factor driving new partnerships in this case study, particularly around the sustainability of Volvic industrial activity and the economic vitality of the area. The role of local resource managers was highlighted as well as multiple drivers leading to the adoption of new practices by farmers. There is a growing interest around agricultural products value-chain intervention, as a key factor to deal with rural deprivation but also as a way to change practices (e.g. organic agriculture).